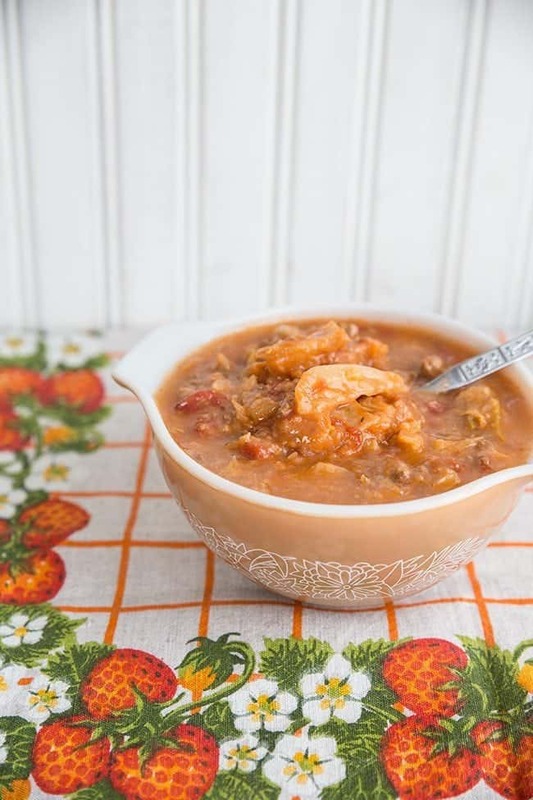 How to make delicious Ukrainian Cabbage Roll Soup! It’s delicious. It’s healthy, hot, steamy, full of Ukrainian flavour amazing. It tastes like my Grandma’s Cabbage rolls, without the actual rolling part. Which means that Ukrainian Cabbage Roll Soup is much easier than making cabbage rolls! Place the onion, garlic and minced pork and beef in the pot. Cook and stir until browned and crumbly,about 5 to 7 minutes. Drain the grease and return to the stove. Simmer for 20-25 minutes until the rice is cooked and the cabbage is softened. Ok fine, so Ukrainian Cabbage Roll Soup isn’t a pretty soup. In fact, it’s so ugly I had no idea how on earth I was going to photograph it so that anyone would be enticed into making it. I could beg and please with you guys ” Seriously! It’s so delicious!” but instead I cheated. Let me distract your eye to the gorgeous vintage tablecloth I thrifted the other day and of course, one of my working pieces of Pyrex. I love the 70’s brown Pyrex. Hey, everything has to have a use. My pinks and turquoise collection is there to beautify my house and my browns are my workhorses. I can put them to work, they are cheaper than their colourful counterparts and you know what? This photo makes me love my 1970’s Woodland set of cinderella Pyrex bowls. It suits that soup, darn it. That tablecloth, though. It was brand new and still had creases in it. I’d wager it’s the same time period, the 1970’s. Someone took it out of their closet, donated it and of course, my eagle eye spotted it right away, knowing that it would be an excellent photo prop. Not only that, it’s a popular choice around the house when it comes time to set the table. Oh, did you want to talk about soup? I guess we can talk about that ugly soup. Did I mention it’s healthy? This packs a healthy punch here folks. This is the kind of cabbage soup diet that I could be on! Well, not really. Let’s face it, desserts are pretty awesome. Man cannot live on cabbage soup alone, but he can make this for dinner this week! 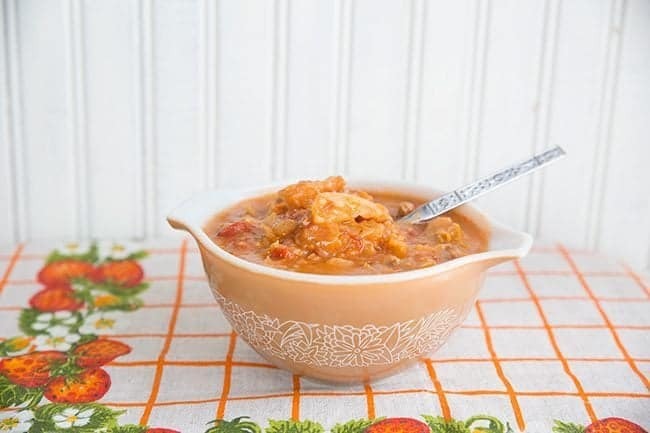 Cabbage Roll Soup is healthy, hot, steamy, full of Ukrainian flavour amazing. It tastes like my Grandma's Cabbage rolls, without the actual rolling part. Which means that Ukrainian Cabbage Roll Soup is much easier than making cabbage rolls! Add chopped cabbage, fry for 3-4 minutes then add all the other ingredients to the mixture. Allow the soup to come to a boil, then turn the heat down to low and place a lid on the pot. To re-heat any leftovers you may want to add additional beef broth to thin out the consistency, it can thicken up once in the refrigerator. I love all your recipes. They are awesome! Can’t wait to make the cabbage roll soup. Love cabbage rolls but they are so time consuming to make. You posted a recipe for fried cabbage with kielbasa I can’t find it anywhere! Could you please help me out? In the recipe you said to fry it sausage first then the recipe just disappeared. I hate making cabbage rolls, this was perfect!! I love cabbage rolls but hate doing them. This soup is easy to make and it taste so good! Thanks a lot. Definitly a keeper! Soup easy to make, substituted bacon fo ground pork. Can you can or freeze this soup? Your soup looks delicious and with a slight mod, will fit perfectly into my dietary needs. I’m making a list of ingredients and trying this tonight! Looks like a good one. Will definitely try it. I made this for supper last night. It was delicious and WAY easier than making cabbage rolls! Glad you enjoyed it!! Yes, cabbage rolls take a lot of time lol. Fry for 304 minutes? Lol. Happy new year! I made this earlier this week. My family loved it! Awesome!! It’s one of my faves! You say to fry the cabbage for “304” minutes. Is this an error? Colman1287 I am guessing 3 or 4 minutes. This is going to be great on Monday when it’s cold and rainy. I think I might substitute some sausage for the ground pork to give it a little spice. I have a crockpot recipe on the website! I keep meaning to make a smaller version! I imagine this is delicious and you are right…easier than an afternoon of making cabbage rolls! Do you have a recipe for lazy perogies??? Me too. I don’t have the time to make everything, all the time, so this soup makes me happy. Easier than an afternoon of cabbage roll making for sure! I was just thinking about making a soup like this but couldn’t track down a decent recipe! My wife’s ancestry is Polish. I think this would go over well in our house. I love “heritage” cooking.